Following significant weight loss, pregnancy, or with ageing, the skin and muscles of the abdomen (tummy) can be left lax and stretched. While exercise and diet will help to partly correct the tummy wall and fat layer respectively, it is generally true that if correction of the skin has not occurred spontaneously with time, no amount of exercise will tighten it. The appearance can also be further marred by the presence of puckered or wide scars. If these things are of concern, surgical correction can be considered. The surgical procedure to correct these problems is known as abdominoplasty, though the more popular term “tummy tuck” is frequently used. with the skin. If the skin has good tone and is not present in excess then liposuction alone may be adequate. Lax abdominal muscles can be tightened with stitches. General anaesthesia (ie. you are fully asleep) is nearly always necessary for the operation which takes 2 to 4 hours (depending on what is done) In a full abdominoplasty, in which all three areas are addressed, a cut is made across the abdomen just above the pubic area (along the bikini line), and the skin/fat layer is freed up to the lower border of the rib cage. The loose skin is pulled downward and the excess removed. Stretched abdominal muscles are sometimes brought together as well. If a lot of tissue is removed the umbilicus (navel/tummy button) has to be ‘relocated’ to its original position. The resulting scar extends across the lower abdomen (and around the umbilicus if this needs repositioning), but is usually covered by all but the briefest swimwear. One day of hospitalisation usually follows the surgery. Drains are usually used and are usually removed the day after surgery. An elastic binder is often applied after surgery and is worn for a couple of weeks. Less extensive changes in abdominal contour can be obtained with a so- called limited or mini abdominoplasty. This procedure is a less radical form of the above, of shorter duration and can be performed as a day patient. Drains are often not needed and recuperation is more rapid. Although the chances of a complication are small, such problems as bleeding, seroma formation, infection, and slow healing are possible. Cuts usually heal well although scars may be quite red and lumpy for a number of months. Some numbness of the skin of the lower abdomen may be noted following the procedure. This improves slowly with time. 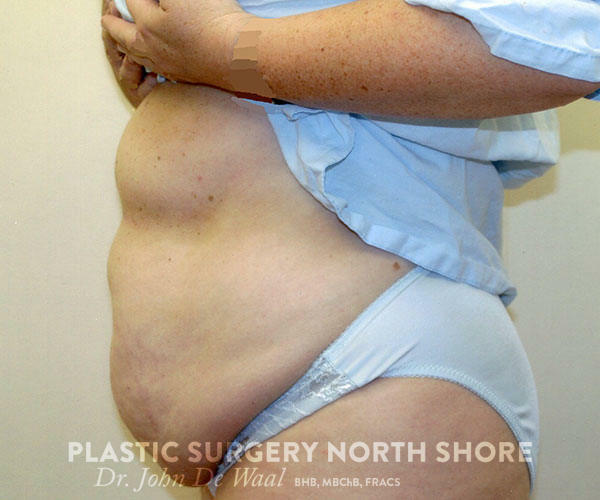 Note that while an abdominoplasty significantly improves shape it does so with the compromise of a large scar. The scar tends to significantly improve and fade with time. Recuperation can be expected within three to four weeks. A return to most activities is anticipated at two to three weeks but full physical activities such as aerobics classes may require six to eight weeks.